Since I always do a Full Moon post when that lovely globe shines at her brightest, I thought I would have to skip the Fabergé Friday this week. The moon is more important. 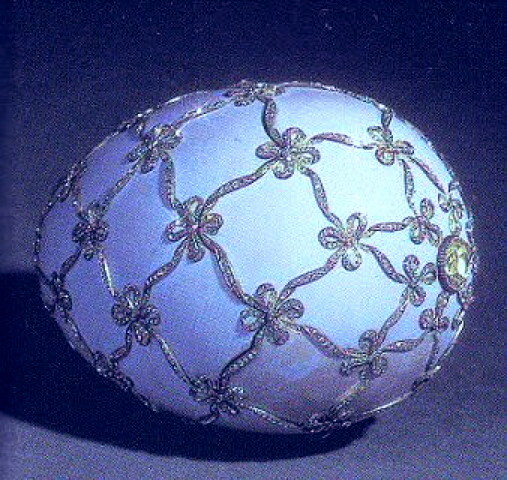 But when I saw what Imperial Easter Egg was next in line I decided it fitted perfectly for a Full Moon post, because the egg in question - the "Swan Egg", from 1906 - actually looks just like a diamond clad moon! 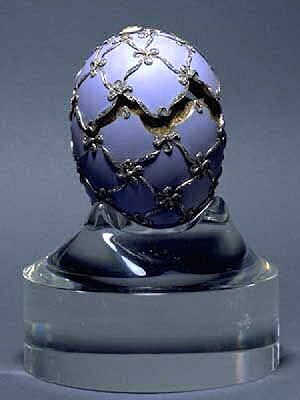 This gold egg is covered in sky translucent-mauve enamel. A trellis of brilliant encrusted ribbons decorate the surface. At each intersection sits a four-looped bow. On top of the egg is placed a large portrait diamond, covering the year "1906". Another large portrait diamond sits at the base of the egg, under which a monogram once probably appeared. ...A miniature swan dressed in platinum, with enameled eyes and beak. 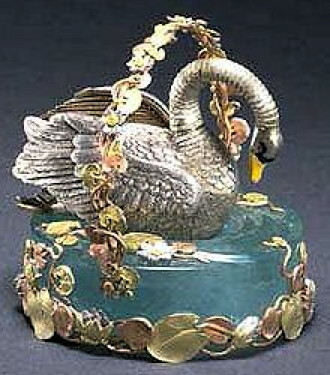 The swan rests in a basket dressed with garlands of flowers in three colors of gold, and a large aquamarine. Built into the swan is a mechanism that, when triggered, makes the swan spread its wings and move its feet and tail feathers. Then the head and neck proudly rise up, before settling down again. 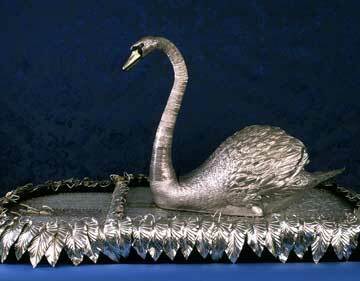 The miniature swan was modeled after James Cox's "Silver Swan" automaton, from around 1773. In Russia the swan is considered a symbol of family life and the permanence of the bond of marriage. Tsar Nicholas II gave this egg to his mother, the Dowager Empress, to celebrate the year of her 40th wedding anniversary. The "Swan Egg" now belongs to Edouard and Maurice Sandoz Foundation, Switzerland. Here is a short video of James Cox's "Silver Swan" in motion! This is such a cool egg Miss Meadows, I love the swan so much!